Congressman Adam B. Schiff represents California's 28th Congressional District, stretching from West Hollywood to the eastern border of Pasadena, and from Echo Park to the Angeles National Forest. During his tenure in Congress, Schiff has focused on bolstering national security, strengthening our communities, helping small businesses, and improving education, safety, and health care for our children. In his 8th term in the House of Representatives, Schiff currently serves as the Ranking Member, or top Democrat, of the House Permanent Select Committee on Intelligence and as a Member of the Benghazi Select Committee. The House Permanent Select Committee on Intelligence oversees the nation's intelligence agencies, including components of the Departments of Defense, Homeland Security, Justice, State and Energy. Schiff is currently on a leave of absence from the House Appropriations Committee. Prior to serving in the House of Representatives, Schiff completed a four-year term as State Senator for California's 21st State Senate District, chairing the Senate Judiciary Committee, the Senate Select Committee on Juvenile Justice and the Joint Committee on the Arts. He led legislative efforts to guarantee up-to-date textbooks in the classroom, overhaul child support, and pass a patient's bill of rights. 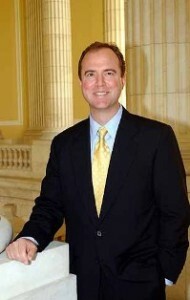 Before serving in the Legislature, Schiff served with the U.S. Attorney's Office in Los Angeles for six years, most notably prosecuting the first FBI agent ever to be indicted for espionage. Born June 22, 1960, Adam is a graduate of Stanford University and Harvard Law School. Adam and his wife, Eve (yes, it's true - Adam and Eve), have two children, a daughter, Alexa Marion, born in July 1998, and a son, Elijah Harris, born in July 2002.